Directed by Brian De Palma and screenplay by De Palma and Louisa Rose from a story by de Palma, Sisters is the story of a model who learns that her separated Siamese twin had been suspected of murder that was witnessed by a newspaper reporter. The film explores the unique relationship between Siamese twin sisters as they deal with their relationship as well as the interference of another woman who suspects one of them of murder. Starring Margot Kidder, Jennifer Salt, Charles Durning, and William Finley. Sisters is an entrancing yet stylish thriller from Brian De Palma. The film is about the world of Siamese twins where a model wakes up one morning to learn that the man she just spent the night was murdered while across the building was a journalist who witnessed the murder. The journalist then learns that the woman might have a twin as it’s revealed that she is one of Siamese twins as she hires a private detective to help out where things get more troubling. It’s a film that plays into a classic scenario of the mystery-suspense film to see if what this woman named Grace Collier (Jennifer Salt) saw actually happened where her journalistic instincts have her going very deep into what is going on. Yet, there’s some strange twists and turns that involves this model named Danielle Breton (Margot Kidder) who may or may not have a clue about what is going on other than finding a dead body in her apartment. The film’s screenplay is unique where the film starts off very low-key and playful where Breton appears on a TV show where she and a contestant in Philip Woode (Lisle Wilson) meet and hit it off where they would spend the night together despite the appearance of Breton’s ex-husband Emil (William Finley). Things seem to go well for much of the first act where there isn’t any suspense with the exception of an argument Philip hears between Danielle and her sister Dominique in French. When he comes back to her apartment with a birthday cake, that’s when the element of suspense occurs where Collier would see Philip’s bloody hand write “help” on the window. Collier would report what she saw to the police who don’t believe her as she hires this very eccentric private detective in Joseph Larch (Charles Durning) who goes into the apartment to uncover secrets while following a moving truck that is carrying a couch. Much of the film’s second act is about Collier’s search to find out the truth where Larch’s help has her learn about who Danielle Breton is where she turns to the journalist in Arthur McLennen (Barnard Hughes) who had written a piece on these French-Canadian twins who had reportedly gotten a surgery to separate themselves. It would then lead to this third act where Collier follows Danielle and Emil as the sense of mystery and intrigue intensifies. Notably where the script would play into this element of surrealism into the relationship between Danielle and Dominique. Brian De Palma’s direction is definitely stylish though from the way he opens the film in its opening credits that is filled with these very strange images of Siamese twin fetuses. Then the film plays into this unique scene where Philip is in a gym locker room where Danielle pretends to be a blind woman where it’s all part of a silly game show that showcases De Palma’s willingness to play with genres and structures as much of the first act starts off very calm and lively. Still, De Palma does create images and such to play into these little moments that would trigger the suspense where it finally emerges in this gruesome act of killing that is very stylized in its presentation. One unique aspect of De Palma’s direction that is interesting is the way he uses split-screens to play into the suspense where one shot has Collier talking to the cops and show them what she saw while Emil and Danielle are cleaning up all of the blood in the apartment. The element of suspense occurs for much of the film’s second half where De Palma keeps much of the suspense low-key to see if Collier would crack the case with the help of Larch. Notably in a scene where Collier enters Breton’s apartment with the detectives where the use of these long tracking shots help play into Breton’s determination to find some clues. By the film’s third act where Collier gets closer to cracking the case, something gets strange where De Palma goes for surrealism in some strange dream sequence where it’s shot in 16mm black-and-white as if it was a documentary. It plays into this world that Collier is entering where it would uncover a lot of the mystery but also reveal how complicated things are for those who are Siamese twins. Overall, De Palma crafts a very exotic yet eerie film about identity and murder. Cinematographer Gregory Sandor does excellent work with the cinematography from the nighttime look of the locations in New York City and Staten Island to the use of black-and-white 16mm footage to play into the surreal dream sequence in its third act. Editor Paul Hirsch does brilliant work with the film‘s stylized editing with its use of split-screens and rhythmic cuts to play into the film‘s suspense. Production designer Gary Weist does nice work with the look of Danielle‘s stylish apartment as well as some of the places she and the other characters go to. Sound editor John Fox does terrific work with the sound to play into the suspense including the scene where Philip hears Danielle and Dominique arguing in French. The film’s music by Bernard Herrmann is amazing for its mixture of orchestral music and eerie electronic pieces to play into the film’s suspense and terror. The casting by Sylvia Fay is superb for the ensemble that is created as it features appearances from Olympia Dukakis and Justine Johnston as two bakers Philip meets, Dolph Sweet as Detective Kelly who is unsure about Collier’s claims, Jennifer Salt’s real-life mother Mary Davenport as Collier’s mother, Lisle Wilson as the man that Danielle meets in Philip Woode, and Barnard Hughes as the renowned journalist Arthur McLennen who reveals some things about Danielle and Dominique. William Finley is excellent as the very strange Emil Breton who helps Danielle cover things up while maintaining this weird presence as he knows more about what is going on. Charles Durning is terrific as the eccentric private detective Joseph Larch who uses unconventional methods to find things in his investigation. Jennifer Salt is brilliant as Grace Collier as a woman determined to find some truth over what she saw as she gets deeper into her discovery while uncovering things that would disturb her. Finally, there’s Margot Kidder in a fantastic performance in the dual roles of Danielle and Dominique where she sports a French-Canadian accent to play into a woman’s innocence as well as her uncertainty of who is who as there’s a complexity to these characters as well as what she is dealing with. 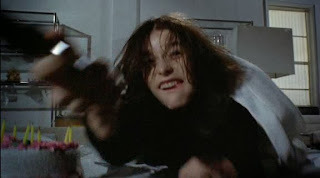 Sisters is a remarkable film from Brian De Palma that features some astounding performances from Margot Kidder and Jennifer Salt. The film is definitely one of De Palma’s great early triumphs as well as very fascinating film on the idea of Siamese twins and identity. Particularly as it also explores many concepts into doubles and such that would be a prominent theme in De Palma’s work. In the end, Sisters is a sensational film from Brian De Palma. Really great review. I need to rewatch this one again. I really liked that Bernard Herrman did a different take on his score and use new elements but it's still classic Herrman. A fine De Palma movie indeed. The birthday cake scenes were memorable and surprised me. It doesn't feel like films that are made today, it was different. @TheVern-Thank you. It is one of those films of De Palma that I really wanted to see as I also loved what Bernard Herrmann did. @Chris-De Palma is a master of suspense and horror and I wish someone would give him better scripts or give him an idea that he can write about so he can make great films again. I do think somewhere, he's got one more great film in him.